David and Louise Turpin face life in prison with the possibility of parole. RIVERSIDE, Calif. — The California couple accused of beating, starving and holding 12 of their children captive pleaded guilty Friday to multiple charges. David and Louise Turpin pleaded guilty to 14 counts each of torture, dependent adult abuse, child endangerment and false imprisonment. Riverside County District Attorney Michael Hestrin said at a news conference that because of the plea deal, the Turpins will not be headed to trial. 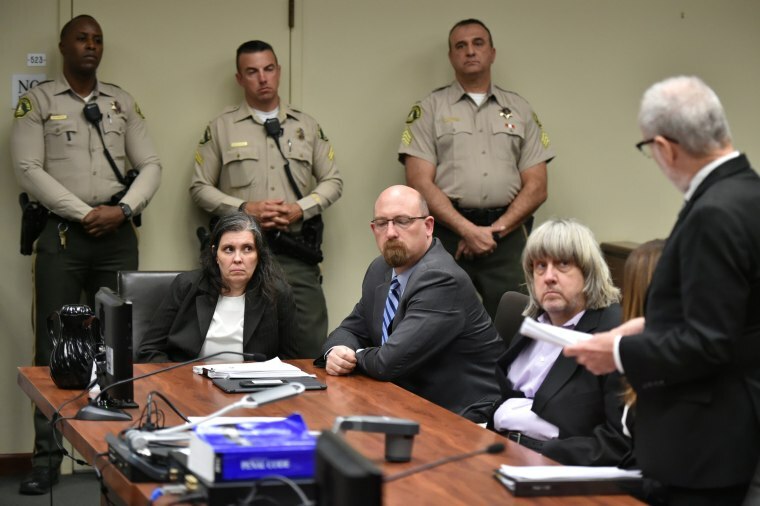 The Turpins allegedly kept their children shackled to their beds inside their home in Perris, California, giving them little food and only allowing them to shower once a year. Prosecutors said last year that all but the youngest of the 13 children — who ranged in age from 2 to 29 — were abused. One of the daughters was allegedly the victim of a lewd act by her father, according to prosecutors. The disturbing abuse came to light in January 2018 after one of the children, who was 17 at the time, escaped the home, which is about 70 miles east of Los Angeles. Hestrin said he spoke to the children Friday and "was very taken by their optimism, by their hope for the future." "They have a zest for life and huge smiles," he said. Investigators said in January 2018 that when they first met the teenager who fled the home to get help, they thought she was 10 years old because she was slight and "emaciated." When officers went to the home, they found the other children held captive in "dark and foul-smelling surroundings," according to investigators. Hestrin said the parents face a sentence of life in prison and will be eligible for parole after serving 25 years. They will be sentenced in April, but Hestrin believes the sentence of life with eligibility for parole will stand.